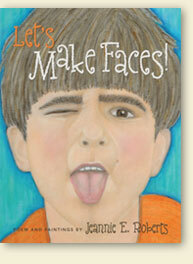 "Jeannie Roberts's book, Let's Make Faces!, made our tummies tickle. I read it to my nieces and nephew and we rolled with laughter as we tried to outdo each other in making faces. It is such an interactive, playful book and we now run to see who can get it first when I come to visit. It makes us feel comfortable with who we are and has done wonders to build up self esteem. I also love that Jeannie uses the spectrum of diversity from the human family. She shows us that we can all make laughter together." "There was a time when mothers would warn their children, 'If you keep frowning and pouting and sticking out your tongue, your face is going to freeze that way!' but Jeannie Roberts has turned that idea onto its head. Instead she says to her readers, young and old, Let’s Make Faces! With rhyme that laughs and dances like creek water over sparkly stones, she celebrates the flexibility of faces by turns 'silly,' 'funny,' 'frisky,' and 'playful,' calling first on the children and then on their grownups to try just a sampling of all the wonderful messages a happy face can send." "My son Logan recently received your book, Let's Make Faces!, for a birthday present. Logan just turned 4 and at age 2 he was diagnosed as autistic. Your book has been a blessing in a way that words can't express. I have been able to connect with Logan on a different level because your book promotes eye contact between us. We read the page, look at the picture, and then Logan looks at me to show him how to make the face, and then he tries so hard to make that same face. It is by far one of the best books that we have ever shared. Thank you so much for creating this book. It has helped my son tremendously. I will recommend your book to many of my friends who have autistic children." © 2015 Rhyme the Roost Books. All Rights Reserved.